It is now 70 years after what was perhaps the most important trial in the history of mankind. What makes this circumstance particularly significant is that it was the first time in history that a murderous regime of a defeated state was put to trial by the victorious powers after a particularly cruel and vicious war. The defendants were tried for acts that confounded human understanding or were not considered criminal before 1945. The exception were those few cases that were prosecuted for war crimes after World War I. Perhaps it would be easy to disparage Nuremberg saying that the defeated had been tried by the “victors’ justice.” What is certain, however, is that in international law nothing was the same after Nuremberg. The most important members of the Nazi government were charged with three offenses: crimes against peace, war crimes, and crimes against humanity. Not included in the trials were Adolf Hitler, Heinrich Himmler, and Joseph Goebbels, who had committed suicide before the trial’s commencement. War crimes were violations of the war laws existing at the time of conflict. Nuremberg was going to be the last time—until the creation in 2000 of the International Criminal Court—that violations of the conventions establishing rights and obligations of combatants were the reason for a trial. The last category, crimes against humanity, was the most original contribution of Nuremberg. It gave character to the trial and insured that, despite its flaws, it would retain a privileged place in world history. In this category were included the atrocious persecution and murder of millions of people by a fanatical and cruel regime. Even today, seventy years later, the atrocities committed by the Nazis move whoever analyzes them. This category, however, affects a basic guarantee that supports the defendants during the trial: that of not being prosecuted for acts that were not considered crimes at the time of commission. 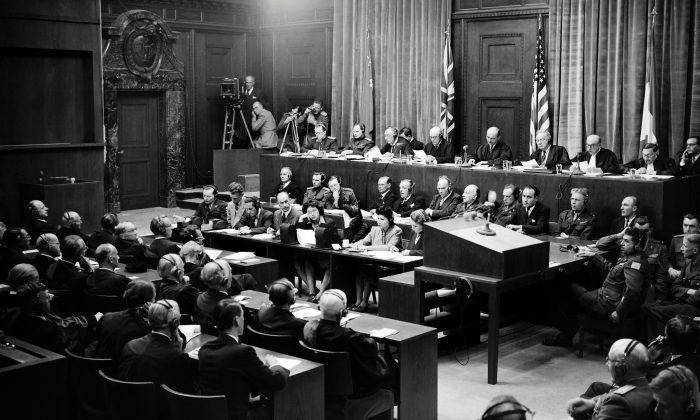 However, both the International Military Tribunal and the twelve subsequent courts carried forward by the United States against all levels of the Nazi government demolished this argument with irrefutable proof that laid the foundations of the science of international criminal law. The ones who ordered or participated in the pogroms, evacuations, mass murders, concentration camp internments, and systematic elimination of millions of human beings on grounds of religion, race, sexual orientation, or political views knew that what they were doing was contrary to the most essential notions of humanity. Nuremberg undoubtedly had many flaws that were multiplied by the equivalent tribunal held in Tokyo the following year. It has left a crucial legacy, however, of the exaltation of human values ​​as recognized for the first time by an international court that, although composed by the victors, stated an undeniable truth. Approximately 200 German war crime defendants were tried at Nuremberg, and 1,600 more were tried under the traditional channels of military justice. Seventy years since the trial that pitted humanity against unleashed evil we have witnessed hundreds of wars. Although those conflicts never had the number of victims of the World War II, they are equal to it in their horror, as has happened in Rwanda, in the former Yugoslavia, and now in Syria and Yemen, to name just a few. Unfortunately, more than a decade after its creation the new court shows very poor results. It has proven to be subject to the vagaries of international politics and has only judged some individuals who have committed crimes in African national struggles. Forced migrations, wars against civilian targets, and mass murders demand a proper response. It is up to today’s leaders to keep “the spirit of Nuremberg” alive. For reviving its true sense of justice, however, it will be necessary an active participation of the U.S. at the International Criminal Court. However, Guantanamo, Abu Ghraib, and other human rights abuses hinder the possibility that the U.S. will resume the leadership once shown in Nuremberg. Alberto Zuppi is an international attorney and a former Secretary of Justice of Argentina. César Chelala is an award-winning writer on human rights issues.